Olivia has been spotted toting this Alexa bag. The Alexa Mulberry bag is named after British style icon Alexa Chung. 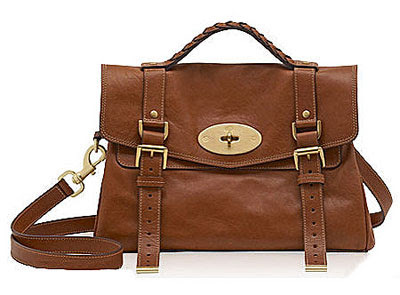 Mulberry's creative team was inspired after seeing Alexa carrying an old Mulberry Elkington briefcase. I love Olivia and Alexa!! I don't get it! I know it's a popular bag, but why? It's like a little boy's schoolbag - I would never wear it or anything like it though there are now tons of lookalikes available at affordable prices. can anyone identify the grey hood coat olivia palmero is wearing? it's cute!! I seriously love the fact that it is all about OP's style...she is at the top of my style inspirations..Thank you. I mentioned your blog on mine "A Pretty Mat"
I love their style! Olivia and Alexa are true fashion icon! Congratulation for yout blog, it's really good! beside you excellent taste, and feeling stilya.